Chocolate Labradors have a shorter life expectancy than their yellow-furred peers and it is as a result of their prized colour, scientists claim. Dogs are often bred for their coat colour and reduces the variation of genes in the dog population and increases the risk of hereditary diseases. Scientists have now found that chocolate dogs were particularly prone to ear infections and skin disease. The analysis of more than 33,000 Labrador retrievers was taken at UK vet practices. Analysis of the collected data on disorder and mortality from a random sample of 2,074 (6.2 per cent) of the dogs revealed the disturbing trend. Professor Paul McGreevy, of the University of Sydney, explained: ‘The relationships between coat colour and disease may reflect an inadvertent consequence of breeding certain pigmentations. ‘Because chocolate colour is recessive in dogs, the gene for this colour must be present in both parents for their puppies to be chocolate. 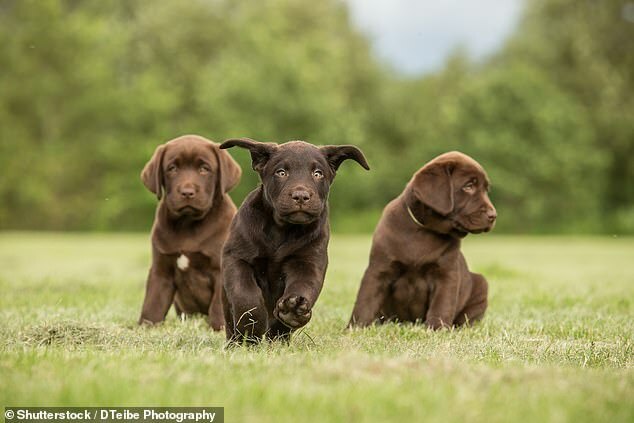 ‘Breeders targeting this colour may therefore be more likely to breed only Labradors carrying the chocolate coat gene.